Recommend improvements to enable adults with serious mental illnesses and children with serious emotional disturbances to live, work, learn, and participate fully in their communities.  Review the current quality and effectiveness of public and private providers and Federal, State, and local government involvement in the delivery of services to individuals with serious mental illnesses and children with serious emotional disturbances, and identify unmet needs and barriers to services. Identify innovative mental health treatments, services, and technologies that are demonstratively effective and can be widely replicated in different settings. Formulate policy options that could be implemented by public and private providers and Federal, State, and local governments to integrate the use of effective treatments and services, improve coordination among service providers, and improve community integration for adults with serious mental illnesses and children with serious emotional disturbances. Focus on the desired outcomes of mental health care, which are to attain each individual's maximum level of employment, self-care, interpersonal relationships, and community participation. Focus on community-level models of care that efficiently coordinate the multiple health and human service providers and public and private payers involved in mental health treatment and delivery of services. Focus on those policies that maximize the utility of existing resources by increasing cost effectiveness and reducing unnecessary and burdensome regulatory barriers. Consider how mental health research findings can be used most effectively to influence the delivery of services. Follow the principles of Federalism, and ensure that its recommendations promote innovation, flexibility, and accountability at all levels of government and respect the constitutional role of States.